Tampa Bay Lightning goalie Andrei Vasilevskiy warms up during a game against the Ottawa Senators on Nov. 10, 2018, at Amalie Arena in Tampa, Florida. Vasilevskiy hasn't played in a game since Nov. 10. 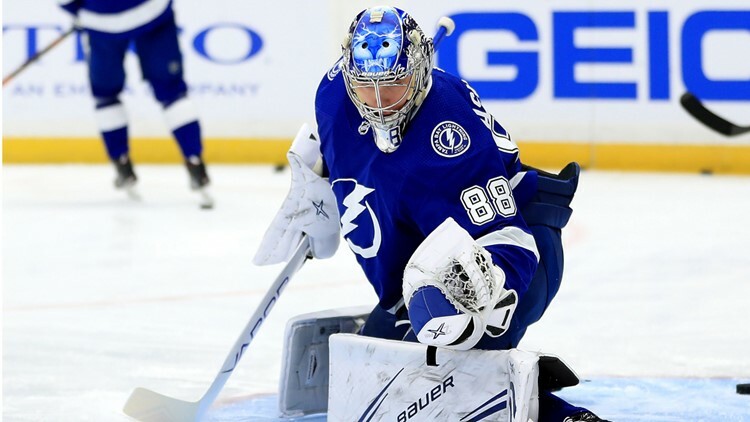 TAMPA, Fla. – Tampa Bay Lightning head coach Jon Cooper said goalie Andrei Vasilevskiy would make his first start Thursday night since fracturing his left foot. The matchup at Amalie Arena against the Toronto Maple Leafs will mark Vasilevskiy's first game since Nov. 10. Lightning goalie Louis Domingue has gone 14-4 in Vasilevskiy’s absence. On Wednesday, 10News reported Vasilevskiy was nearing a return because the team reassigned goalie Eddie Pasquale to the Syracuse Crunch of the AHL. NHL rules mandate teams must have two goaltenders on the active 23-man roster. Vasilevskiy is 9-3-1 in 13 starts during the 2018-19 season. The puck drops at 7:30 p.m. ET Thursday.